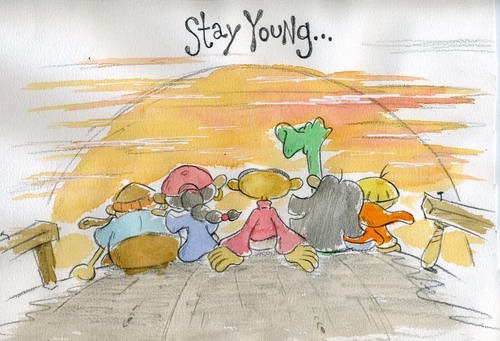 Stay Young. One of Mr W's watercolours; this appeared at the very end of the credits of Operation: I.N.T.E.R.V.I.E.W.S.. HD Wallpaper and background images in the Codename: Kids siguiente Door club tagged: codename kids next door knd mr warburton concept art sector v painting. Awwww! This makes me feel nostalgic and sad (this pic was on op. I.n.t.e.r.v.i.e.w.s.) at the same time!! Awwww... too sweet & sad!! This pic is such a tear jerker!! I miss them all so much! !